Khaty Xiong is a second-generation Hmong American from Fresno, CA. Born to Hmong refugees from Laos, she is the seventh daughter among her 15 brothers and sisters. She received her Master of Fine Arts in Poetry from the University of Montana, and is the author of two poetry chapbooks: Deer Hour (New Michigan Press, 2014) and Elegies (University of Montana, 2013). Xiong’s work has been featured on The New York Times and Verse Daily. Her first full-length collection Poor Anima was released by Apogee Press on September 1, 2015. Being one of so few publishing Hmong American writers, I’m not sure I can say; rather, having Poor Anima out in the world has yet to change my life. I will say it has been an honor being one of the first to publish a full-length poetry collection, since Hmong American literature is still very much an uncharted territory. 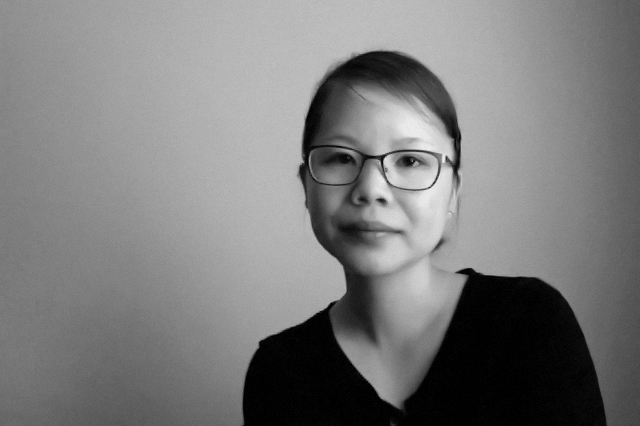 Aside from Kao Kalia Yang’s memoir The Latehomecomer (Coffee House Press, 2008), I believe Soul Vang’s To Live Here (Imaginary Friend Press, 2014) is officially the first poetry collection published in the United States; both books have been crowning moments for the growing Hmong literary movement. Where I come from, my people don’t have literature; the Hmong have always relied on its oral practices of storytelling, and other art forms such as sung poetry (kwv txhiaj), traditional needlework (paj ntaub), and story cloths to pass down information (from customs, instructions, traditions to history). In other words, it’s a very new thing to publish a book at all as a Hmong American because so few are aware of my people’s history or presence in the United States (and in other parts of the world). Besides my book release, a lot has yet to come and shape this uncharted, literary territory. Regarding how my recent work compares to my previous, I suppose I’ve learned to listen as well as trust what is happening or has yet to happen on the page. I used to worry a lot about how I wanted a poem to “be,” which was unfair to both the poem and myself. Now, I’d like to think I’m less impatient with how a poem “begins” or how it decides to live; I’m often finding myself being led by the poem, and it always happens when I least expect it. I first came to poetry through my parents, and of course, my native language. The Hmong language is a very poetic language. The Hmong’s animistic approach to life and death has always been influential to my fascination and love for poetry too. More specifically, the art form of sung poetry (kwv txhiaj) really inspired me as a kid. This form is essentially a person singing their “life song”—equivalent, to, what I tell people for “comparison,” the Blues; it’s a complicated form, actually (my mothers tried teaching me but to no avail); there are these rules that I never caught onto like meter and rhyme schemes that required an immense grasp and knowledge of the language. Anyways, growing up, I heard my parents sing their life songs all the time. It’s a form that really catches your attention, because the emotions coming from the singer is controlled in such a way that surprises you—some of the more commonly expressed emotions are loneliness and sadness, or some kind of sorrow, the kind that aches real bad. Most of the time, these songs are about longing—for your parents, loved ones, deceased relatives, your home country, and so on. Basically, it was hard not to sit down and listen when my parents sang because they were telling their stories of pain, and most of these stories originated from another part of the world where I would never get to live and experience (but am often haunted by): life in Laos before, during and after the Vietnam War—a war where the Hmong, among other indigenous groups, were secretly recruited by the CIA and then left fending for themselves when Long Tieng, a Laotian military base operated by the CIA, fell in May 1975; outside of U.S. history books, this war is known as the Secret War. Needless to say, I took these opportunities to learn from my parents. They seldom talked about their personal feelings: their transition from hiding in the Laotian jungles to crossing the dangerous Mekong River in order to reach Thailand’s refugee camps, from Thailand to the United States; and when they did “talk,” it was usually through their songs. Those songs did more than teach me to listen (and to remember); they also taught me to pay close attention to the world. All writing projects take time for me—mostly because it takes some living first before any writing can happen. For that reason, my writing process is slow. Some first drafts have influence over how the poem will turn out in its last draft, and sometimes, not. It depends on the poem, and what it is saying or doing at the time. Most of my projects start out as individual poems, but then eventually those poems begin talking to each other. So, I suppose I do work in a kind of “project mindset” without realizing it—or it simply has something to do with my obsessions that haven’t quite fully been “written out.” This isn’t the case with all my poems or projects of course. My chapbook Deer Hour (New Michigan Press, 2014) is actually a book of collages created during my time in Montana. I had collected various newspapers, journals, and National Geographic magazines that I used to cut out words and images to make said collages. These pieces were initially made as gifts for friends; the individual I was making the gift for inspired each piece. But one day I thought about how those poems would look if they were transcribed into a book; I put them together and was surprised how much they sang and told a story. I ended up adding more collage-inspired poems to lengthen the book. Deer Hour is unique from my other projects because its manuscript was born from found material, albeit, with some creative liberty in the transcribing of those pieces. I’ve only actually done one reading since I’ve moved to Columbus, OH. The reading series I participated in is called Paging Columbus, and the wonderful poet and writer Hannah Stephenson is the curator; the reading runs once a month. I had attended a few and really admired its monthly reading themes. Then one day Hannah invited me to be a part of their “Trust the Process” section, where I got to share some thoughts on my creative process and read some of my work. Most of my readings in the past have been school-sanctioned events, so my appearance in Paging Columbus was my first public reading. I really enjoyed it, but I was also very nervous. Still, I think public readings are great; poetry should be shared aloud; it adds this element that can’t be found or experienced anywhere else. I just wish I wasn’t so shy about making public appearances. I actually have an upcoming reading at an alumni event that I’m very nervous about. A lot of the fire that fueled my writing started in undergrad. There will be a lot of important people there like my professors. I think being a writer and coming from a (Hmong) culture where literature does not exist poses all kinds of theoretical concerns. It’s hard not to be political and scared behind the writing because the few Hmong writers who are publishing, myself included, aren’t exactly following any particular footsteps; we’re paving the way and doing it all on our own, which makes the writing as well as the living experience, if I can speak on behalf of the others, trying, triumphant, and rather lonely. In Fresno, CA where I’m originally from, a group called Hmong American Writers’ Circle (HAWC) was formed in 2004 by Hmong poet and writer Burlee Vang. Their purpose has essentially been trying to create and establish that literary culture among the Hmong. I was very honored to have been selected to make an appearance in their How Do I Begin? : A Hmong American Literary Anthology (Heyday Books, 2011), a one of a kind anthology full of creative writing from Hmong Americans across the Central Valley of CA and elsewhere. Next to Kalia and Soul’s books, this anthology was another proud achievement in the Hmong literary world. As for the kinds of questions I am trying to answer with my work, I can’t exactly say—not because I won’t, but because I’m still figuring out those questions myself. It’s complicated because even I can’t ask my parents the right questions for things I want to know more about—their life and history in Laos, where our family and people truly came from and so on. I recall being told about stories regarding my great, great grandparents who used to live in China before they immigrated to Laos, but as far as I’m concerned, there are no confirming records of such sort within the family; again, “written records” are also rare if not nonexistent. I did however hear of an uncle who’s interviewing his father about said stories so as to write a book about how the Xiong clan came to be; I am much looking forward to this book. Still, my time in school and away from home has really crippled my use of Hmong. It’s as embarrassing as it is terrifying, the thought of forgetting the tongue of your parents. For me, the Hmong language has only ever been the one thing separating me from being Hmong and not Hmong, so it hurts a lot that while I’m chasing this literary path, writing and speaking dominantly in English (about being Hmong), I find myself further removed from my language, my parents, and my heritage—making all of this exhausting, because I identify in English like I can’t in Hmong, and I feel in Hmong like I can’t in English, which adds a lot of stress in identifying those questions. These are good questions but tricky to answer in part because I’m also still learning what the role of the writer is or should be. I suppose the “writer’s role” reminds me that of a teacher’s role: to lend your body to your subject(s), and to hand yourself over to your students and understand you are doing so, safely and surely. I hope that makes sense. Perhaps I should say that I have witnessed this as a student, and have attempted to do this during my time teaching at the University of Montana. It was incredibly challenging, but nevertheless humbling and instructive for me as a person, a student, and a poet. Regardless, as a writer (and teacher), risks are always involved. One could say such role(s) means one has to be a bit of a daredevil. Sometimes, more than a bit. I think the writer’s role is being both teacher and student, where the questions and hardships are endless, and the writer accepts this. I think working with any outside editor will always prove difficult, which makes the experience all the more important. Just having an editor look at your poems and saying “this isn’t working as well as this other poem” can really change the life of the manuscript—and in my case, for the better. I’m very hard on myself and that can sometimes setback a poem or the pulse of a manuscript, so it’s very refreshing to suddenly not feel alone about the making of a book. I couldn’t have been luckier to have editors Alice Jones and Ed Smallfield of Apogee Press overlook the project of Poor Anima; they took great care of me. In undergrad, I wrote at various times of the day. Since then, I have learned that I write best in the mornings. I also know that the weather often influences when I want to write. In fact, overcast days are my favorite writing days—because I will actually spend many hours writing, sometimes the whole day. Although, when I was in Montana, I always wrote a lot after my hikes (overcast or not). I tend to shoot a lot of photography during my hikes too, so that often helps me in the crafting of poems. My writing routine generally involves a lot of activities, most of which are non-writing. These days, hiking through some of Columbus’s metro parks recharges my “inspiration,” especially now as the season is changing. Being outside in general is where I feel closest to my mind. Sometimes I’ll return to collaging and that will often spark something too. And if neither of those work then reading the latest publications both online and in print will typically do the trick. I think the fragrance of fresh fruit best remind me of home: particularly strawberries, peaches, and watermelons. Growing up in the Central Valley, there were fruit stands everywhere, and farmers’ markets that would last year-round. Besides, my parents loved these fruits and would often spoil my siblings and I with these. Sometimes, when I’m grocery shopping, I will stand in the fruit section and smell a basket of strawberries, or pick up a few peaches and smell each of them. I do this when I miss my family, which seems to be every grocery visit. I’m deeply influenced by many things and nature is definitely one of them. My time in Montana is perhaps the biggest influence on both Deer Hour and Poor Anima. In Montana, it was easy to love the outdoors and its wildlife. It wasn’t unusual to be greeted by a mule deer clopping along your bus stop, or to wake up to ten mule deer resting and warming in the sun right on your front yard on a chilly autumn morning. The state is essentially a wilderness paradise. I had developed this strong relationship to Montana because its landscapes also made me think a lot about my parents and what their home country might have looked like once upon a time. The state is actually also home to some of the first Hmong refugees after the Vietnam War when General Vang Pao, commander of the CIA-recruited Hmong Army, and some of his veterans and their families arrived in 1975. Coming to study at the University of Montana was truly fate; being in Montana alone gave me a real sense of place and direction in my writing. There are many writers that I admire and writings that have been important for my work, though it’s difficult to keep track of all of them. For now, I will list (in no particular order): Li-young Lee, Philip Levine, James Wright, Emily Dickinson, Arthur Rimbaud, Sappho, Li Po, Theodore Roethke, Richard Hugo, George Oppen, Paul Celan, Don Mee Choi, Elizabeth Willis, Mary Jo Bang, Catherine Barnett, Cathy Park Hong, Brenda Shaughnessy, Adrienne Su, Lynn Xu, Lo Kwa Mei-en, Pattie McCarthy, Elizabeth Robinson, Lyn Hejinian and Ann Lauterbach. However, there is one poet whose work I often return to for both inspiration and influence: Tu Fu. See the world; travel to outer space. When I was a kid, I wanted to be three things: an archaeologist, a paleontologist, and an astronomer. I still do. I had this deep fascination for the world, what was inside and beyond it. Instead, I turned out to be a poet; it’s safe to say the fascination remains the same. Writing was always cathartic as well as it was therapeutic; writing was also hard for those reasons—coming to terms with how I felt about things and the people around me. When I was in high school, my freshman English teacher Megan Bohigian saw potential in the work I was turning in for our creative writing assignments, and she simply nurtured me. She gave me hope and a voice from the beginning. She believed in the work I was doing, and I have been writing since. I am deeply indebted to her. Hmm. If I had list one, it would be Pattie McCarthy’s Marybones (Apogee Press, 2012). As for the last great film, that’s also hard to say because I just finished my Hayao Miyazaki marathon I started in spring, and the last film I watched was Spirited Away. Though, Princess Mononoke is my true favorite. I’m working on poems that discuss my grief over my late brother. He passed on June 4, 2014 due to cancer. My poetry has been in a weird place since; I say this because he was the original historian in the family who got me to care about what I write now. He was very serious about documenting our family’s history, their time during the Secret War and so on. He was born the year Long Tieng fell; he was just a couple of weeks old at the time; when my family arrived in the refugee camps in Thailand, my brother was about five or so years old. He was rich with stories, and had this dream of writing a book about my family’s experience. Unfortunately I never got to collaborate with him or even share my work. His passing was very hard on my family, and unexpectedly difficult on my work as well. The past year, I’ve been writing letters and poems to him, asking for those stories, for guidance, his wellbeing. I’m constantly searching for him, for signs or messages that mark his presence, in dreams and in waking life. I really miss him, and I would still like for him to read my poems. I am hoping to turn these pieces into my next collection. I went to high school with Khaty and from the very first time I met her and read from her, I knew she'd publish someday. I didn't know when, but I knew she would. It's really breathtaking, her writing. It literally feels like her soul is trying to show you something. I think people in general want to write and publish (as do I), but Khaty's talent and voice (or whatever swims up in her mind) needs to be written. Shared. Spread around. And consumed. Someday, I'd like to be like Khaty. Until then, I'll just be a fan!